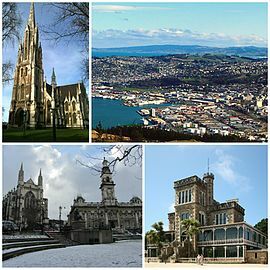 Dunedin, (kent in the Māori leid as Otepoti) is the 5t lairgest ceety o New Zealand wi mair nor 142,000 indwallers. It is situatit in the sooth-east o the Sooth Isle. It's the ceety wi the lairgest population o Scots in the kintra, syne aboot the 1860s. ↑ "Southern style". Stuff.co.nz. 19 March 2009. Retrieved 15 March 2011. ↑ "Supersport's Good Week / Bad Week: An unhappy spectator". The New Zealand Herald. 1 May 2009. Retrieved 18 September 2009. ↑ Irwin, Geoff; Walrond, Carl (4 March 2009). 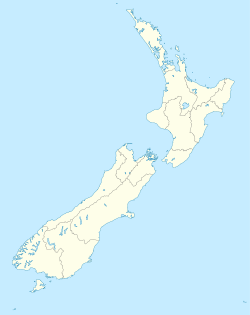 "When was New Zealand first settled? – The date debate". Te Ara: The Encyclopedia of New Zealand. Retrieved 14 February 2010. ↑ "Mayor Dave Cull". Dunedin City Council. Retrieved 14 February 2015. Wikimedia Commons haes media relatit tae Dunedin, New Zealand. This page wis last eeditit on 18 September 2018, at 04:55.